SAN DIEGO - The amphibious transport dock ship USS Somerset (LPD 25) is scheduled to arrive at its new homeport of Naval Base San Diego, April 21. Somerset was formally commissioned March 1 during a ceremony in Philadelphia and shortly afterward began a journey from the Atlantic Ocean, through the Caribbean Sea and Panama Canal, to San Diego. "The crew of Somerset has worked extremely hard to train, qualify and prepare this great ship for service. They have met all challenges head-on and they have produced outstanding results exceeding all expectations," said Capt. Thomas L. Dearborn, Somerset's commanding officer. "The crew has long awaited our arrival in our homeport of San Diego and we are truly excited to be reunited with our family and friends." The ninth San Antonio-class amphibious transport dock ship, Somerset is named in honor of the crew and passengers of United Airlines Flight 93 that crashed near Shanksville, Pa., in Somerset County during the 9/11 terrorist attacks. Somerset represents the heroic actions of the 40 crew and passengers of United Flight 93, honoring their collective sacrifice and the tremendous courage displayed in the face of overwhelming adversity. 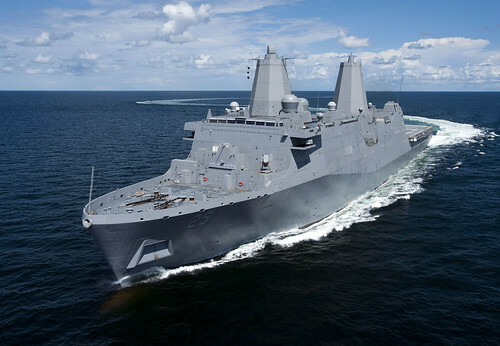 The third of the three U.S. ships named in honor of those victims and first responders of the 9/11 attacks on the World Trade Center and Pentagon, Somerset joins USS New York (LPD 21) and USS Arlington (LPD 24) as part of the Navy's combat force.